Real Madrid's pursuit of Gareth Bale is one of the long running saga's of the summer and if the deal is to be done it is likely to result in a fee in excess of £80m. He is not worth it or anything close to it nor will any player be worth it in the history of football ever certainly in real terms. There is an argument which I rather like for its simplicity if nothing else is the value of an asset in this case a footballer is the price that that a willing seller and a willing buyer agree it is worth. However that does not really help anyone who might want to analyse whether the seller or the buyer has the better end of the deal or as I will argue should be carted off to the nearest asylum for the economically insane and detained indefinitely. There is little point in even trying to compare Bale to any other player and use the lower fee as a benchmark. For starters that fee might not have been any more rational that the one that will lure Bale from White Hart Lane. Besides which the circumstances of the sale would almost certainly be different and that is without straying into the wonderfully subjective argument as to whether or not player a is better than player b. In search of a starting point it is possible to quantify the value of his contract at Spurs (which is in effect what Real Madrid are buying). Bale has 3 years left to run on a £3.9m p.a. contract which is worth £11.97m. That is the bottom line price to pay more or demand more implies that there is an economic worth to the seller and buyer in this case of £68m or £22m per season. If the price is a rational one the purchasing club should be able realise £22m additional value from the transaction. For the sake of argument I will set aside the slightly inconvenient fact that the player will demand and get a pay rise on joining Real so the true break even point might be set even higher. a) Sell the player to another club. If Spurs sell this is what they are doing and is the justification for their original £10m investment in the player when he was a teenager with nothing much more than bags of raw potential. Whether it really justifies the original investment is debatable although it will now be cited as the rationale for every inflated fee that is paid for a promising teenager. However like all long shots clubs tend remember the ones that succeed spectacularly but overlook the slow bleed of the those that do not. Spurs are fortunate in one respect that they can sell to a club that typically pays bigger fees than itself there are probably about 10 clubs in Europe who could reasonably be expected to be potential customers although that number dramatically decreases when a fee of £50m or above is demanded, but Real Madrid are not. Put simply if they buy Bale they will never make a profit on the deal because there is no other club to whom they could sell him although there would be plenty to take a chance on a cut price deal should they be unloading him in a few years time. The key flaw in this approach aside from the vagaries of form or injury is the player is perfectly at liberty to not sign a new contract and walk away for no fee thus reducing their value to the club to zero. b) Generate additional income through the signing. There are players that are so iconic that there presence at a club generates additional income through commercial deals, additional ticket and merchandise sales. However the player has to be the unique talent of his generation and have a global appeal that is greater than the club he is joining. Beckham to LA Galaxy springs to mind as the type of deal that might just work on this level. However it is very easy to overestimate the value of such spin offs claims that Manchester United would make the £22m they spent on Van-Persie in shirt sales are laughable even given the well oiled commercial machinery at Old Trafford. Bale will have zero impact on any of Real Madrid's income streams. c) Generate additional income because of the signings impact on the pitch. The only thing that Bale can achieve on the pitch that makes the slightest bit of difference to Real's income is to win the champions league. With a potential windfall of £60m for winning it the Champions League offers a route to recouping the money, although that only represents a £40m net increase on a final 16 place that Real can pretty much count on regardless of what they do in the transfer market. The fact that previous expensive forays into the transfer market have not delivered the Champions League Trophy or even a final appearance since 2002 might sow a few seeds of doubt that the formula works at all. If Bale is a success, stays at Madrid for four years during which time Real win the Champions League twice the fee makes perfect sense. That is of course assuming that those victories are in large part attributable to Bale' s presence. 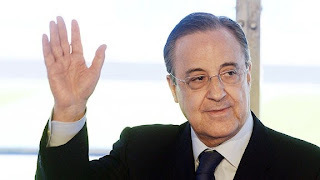 If any of that seems unlikely then perhaps someone should send the men in white coats for Real President Florentino Pérez. Equally if Daniel Levy turns down an offer of £80m then perhaps they should stop off at White Hart Lane unless of course he knows that Perez really is barking mad and will go higher.